The Second Death Star is hovering in the sky above the forest moon of Endor, protected by a shield generator on the moon's surface. A small strike team has been sent to the planet's surface, led by General Solo, to take out the generator while Rebel ships attack the Death Star from above. Upon arriving, the Rebels discover furry inhabitants who will play a crucial role in defeating the Empire. The Empire has also deployed new forces to secure their new battle station. Everything hangs precariously in the balance and the success (or prevention) of the operation now lies in your hands! 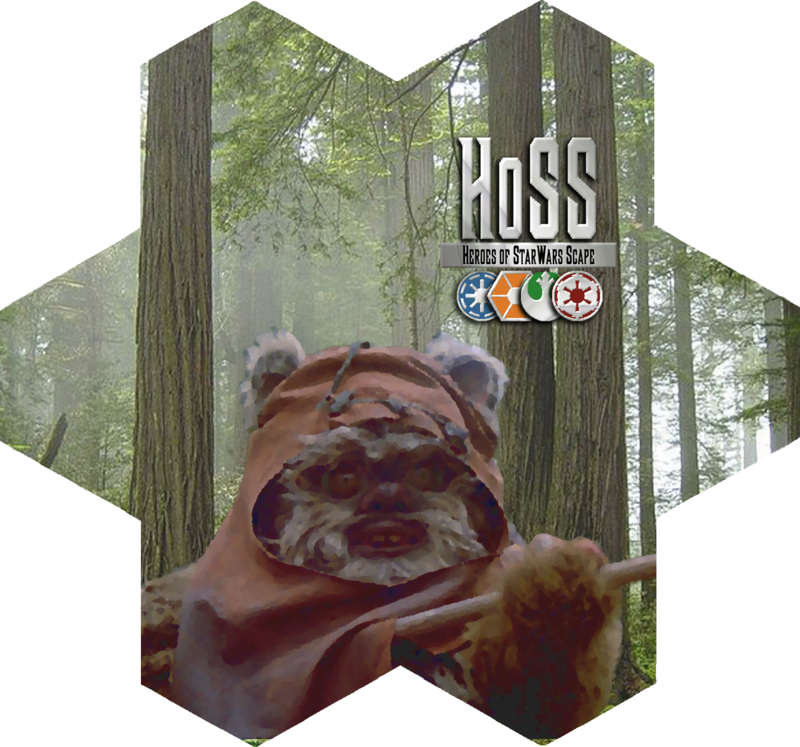 A new sub-faction arrives in the form of the Ewoks! With 2 Unique Heroes, 2 Common Heroes and a Common Squad, they arrive with bonding, rock bombs, battle horns, log traps and distractions! Jedi Luke Skywalker and Chewbacca are already part of the Strike Team attacking the Imperial Shield Generator, but they are joined by General Han Solo, the cleverly deceptive Strike Leader, and a camo-wearing version of Princess Leia, feisty as ever! Even C-3PO makes a new appearance as the Ewok Deity, uniting the Ewok and Rebel forces to tip the balance against the Empire. 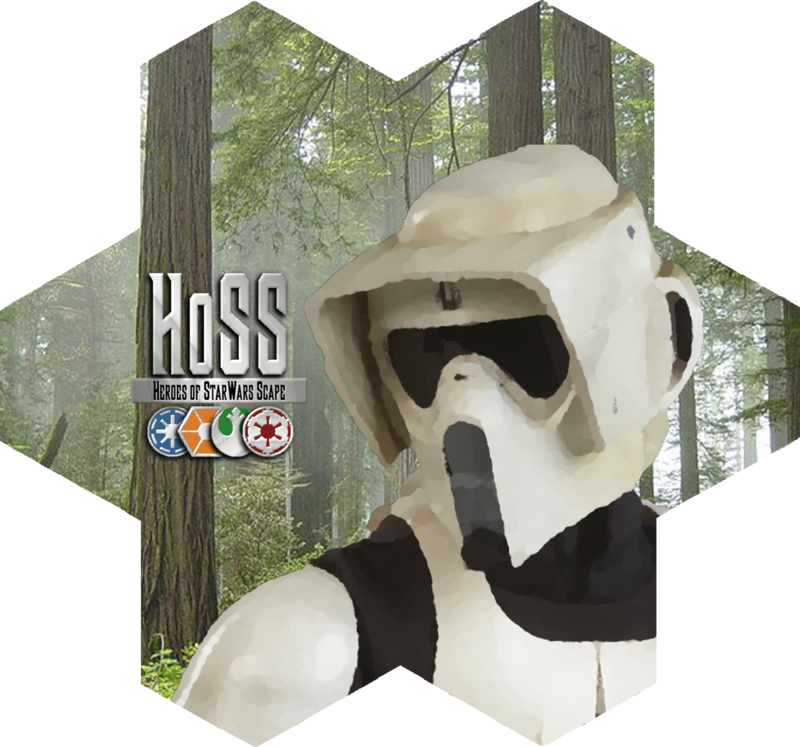 Patiently guarding the Shield Generator, waiting to spring a trap on the Rebels are the AT-STs, Stormtroopers, and Imperial Officers of previous releases, but two units are freshly deployed on Endor. The Scout Troopers bring their reconnaissance and sniper abilities to bear as ground troops, but also make use of Imperial Speeder Bikes to race through the forest and strafe enemy formations. With Adventure Pack 3: The Forest Moon of Endor, the releases for the Original Trilogy are complete. A special release of a figure here or there is still in the works, but we are turning our attention to the second trilogy, beginning with Episode I: The Phantom Menace. Below are links to the individual threads and PDFs. The card images are also available in the X-2 Customs Card Printing App. Finally, for those of you who print double sided cards, mac122 has also put together a Galactic Empire (Endor) card back and an Ewok card back to go along with the already released Endor Leia card back. They are available in the X-2 Customs Card Printing App as well as in the PDF files linked above. We hope you enjoy this release, and have a happy NHSD! Alright. We made it. Hope everyone enjoys these. Congratulations on completing the trilogy, jedis. Good job! Congrats on rounding out the trilogy, guys! Congrats guys, the Ewoks have come a loooong way since I first tested them!